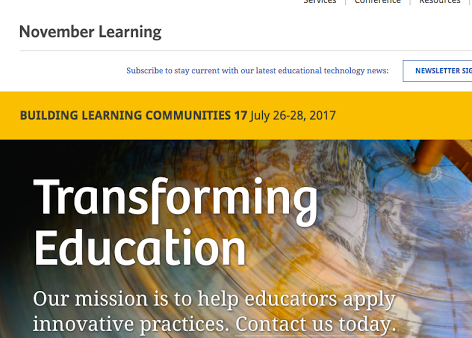 Alan November, November Learning, has just published this article about redesigning and redefining the roles of the learner and educator. In his article, Alan poses two questions to leaders to assist in defining the problem technology brings to learning. From there, he offers a framework of six questions education leaders can use to assess whether "technology has brought transformative value to instruction." 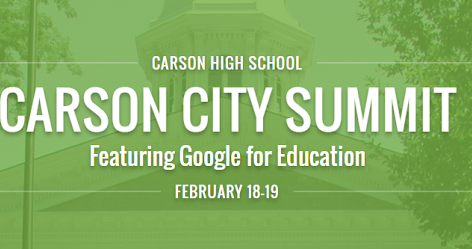 Carson City is hosting a Google Summit on February 18-19th at Carson High School in Carson City, Nevada. There is still time to register if you are interested in attending. Register here. 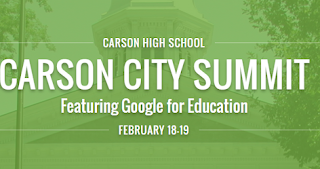 Allie Eckert, Digital Coach at Adobe Middle School, will be presenting a session at the summit on "Using Google Classroom to Enhance Formative Assessment"
Allison Eckert, Digital Coach at Adobe Middle School in Elko, NV, saw a need for a Chromebook violation tracking tool for students. According to Ms. Eckert, each student has a copy of the Minor Violation Card in their Chromebook case. If a student violates one of their rules, the infraction is recorded on the card. Three minor violations result in 3 lunch dententions. 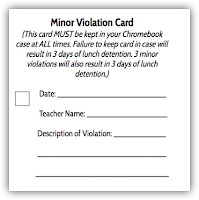 Violations can also be recorded on a shared Google Sheet, in case students lose card (intentionally or not!) This spreadsheet can be accessible to all teachers at a site, who could easily add a running tally of students' infractions. Finally, Ms. Eckert made an online quiz for Adobe Middle School to keep students accountable for their Chromebook. The questions help students identify and understand their responsibilities with the use and care of their Chromebook. Thanks to Justin Clark, Carson Middle School, for sharing his lesson plan, "Structural Adaptations Tech Directions". His lesson makes use of Google Classroom, Google Docs, BrainPop, Read and Write for Google, and Google Draw. To make a copy of his lesson plan, click here. The thing that makes an unconference unique is the agenda and schedule is set at the unconference. 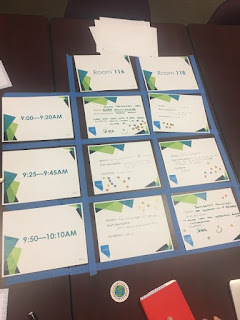 Participants build the session board, the official schedule of the event pictured at right, by brainstorming discussion prompts, big ideas, questions they might have on a process, and resources and strategies they might want to share. "What are you excited about?" "What are you an expert at?" "What would you like to explore?" "What might the ideal unconference session look like?" "What would be the benefits, to us, if we engaged in that way? What could we accomplish?" "What behaviors or obstacles might stand in the way?" "What is one thing you are willing to do to help us all achieve the ideal unconference experience today?" The keynote speech lit a fire under everyone and we were able to come up with more than enough session topics to easily fill our session board. Each participant used small stickers to vote for the sessions they would like to go to. The session topics that received the most votes were chosen and moved onto the session board. Check out the session board we made by following this link. Because not all participants could attend each session, one person at each session took notes on a collaborative Doc. This record was an important document, as participants could draw from the information after the unconference. 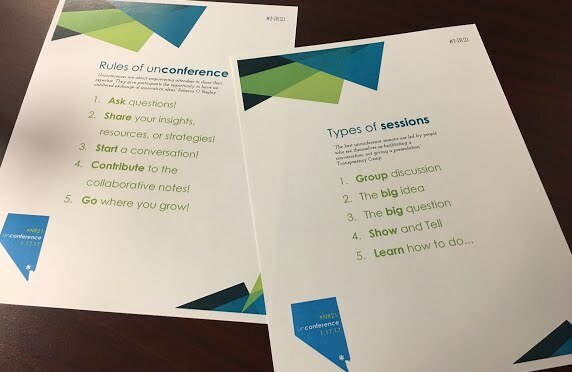 During the unconference, each session incorporated honest collaboration and communication between the participants. The unconference ended with a closing circle led by Robert Jones, project manager for the Nevada Ready 21 program in Clark County School District. 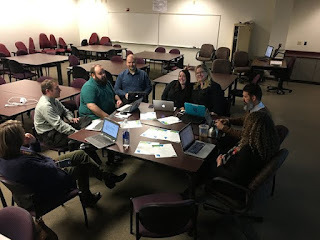 Each participant shared their insight and detailed what they took from the event and explained how they were going to share this with the teachers and staff at their school site. If you would like to run an #NR21 unconference at your school, download the materials using the links below. The Paw Print, created by students from Bob Miller Middle School, is now out! They have put together a terrific newsletter using Google Sites. Find out what students think of Snapchat plus much more. Check it all out here. 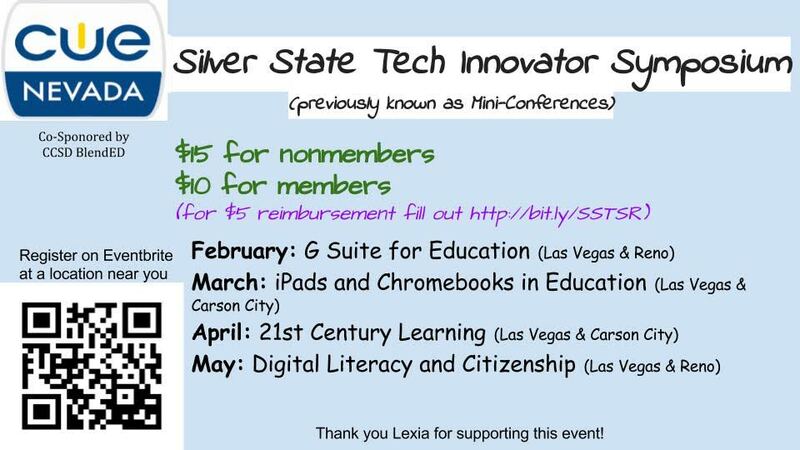 There are quite a few tech training opportunities available to Nevada educators in the coming months! CUE Nevada is sponsoring a tech event at Douglas High School on January 28, 2017. Check here for more details and registration information. 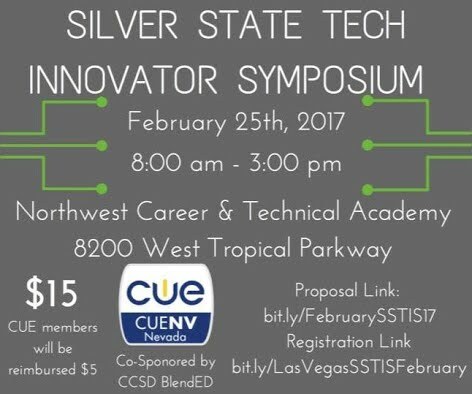 CUE Nevada is offering up a symposium in February that will focus on the G Suite of apps from Google. Register for the event here. CUE Nevada is also offering themed training throughout the spring. In March, CUE Nevada will showcase a training on iPads and Chromebooks, in April a training on 21st century learning, and in May a training on digital literacy and citizenship. Head over to this link to find the event nearest you and to register. 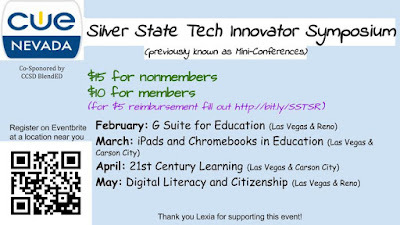 CUE Nevada is sponsoring the Reno Spring Tech Camp which will be held April 28 and 29. Click here for more details regarding this fun event. Athena Walker, Digital Coach at Pinecrest Inspirada, has shared another great method to disseminate information to her staff and students. 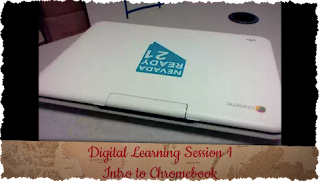 "I create Digital Learning Day videos that teachers show in their homerooms. I use these to communicate important information to students and to ensure every student has the same knowledge base regarding topics such as Chromebook care and functionality, technology expectations, procedures, digital citizenship, and technology contests and after-school clubs." 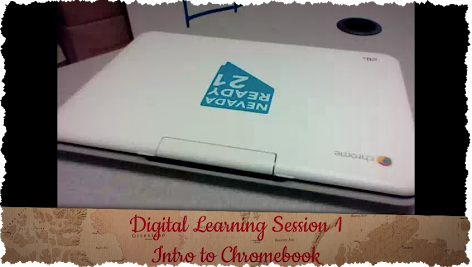 View Digital Learning Session 1, Intro to Chromebooks, here. Teachers are starting to think outside the box when creating resources in Google Slides. Athena Walker, Digital Coach at Pinecrest Inspirada, changed the page setup of a Google Slides deck to resemble an 8.5"x11" piece of paper. She then used it as a canvas to create an interactive newsletter she sends out to her teachers. Athena writes, "I am using Google Slides to create monthly interactive newsletters for our teachers. 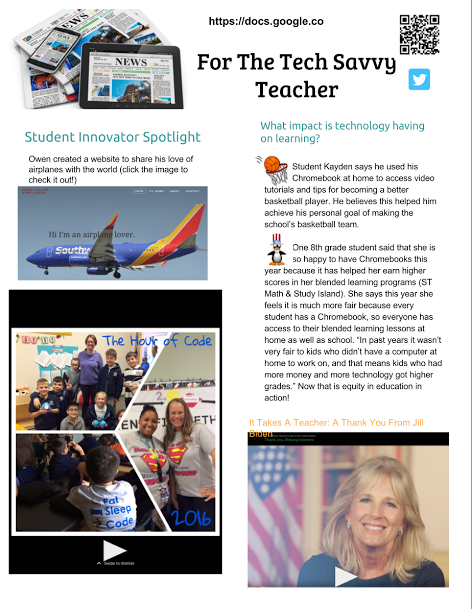 The newsletter is a great way to keep teachers and administrators informed, share successes, and highlight innovative ways teachers are integrating technology." The interactive newsletter can be updated with any content, so teachers can use these with their students, too. Imagine an online newsletter from your school's student council! Check out her December Interactive Newsletter. Make a copy of the newsletter that you can edit for your own school. Note taking in the digital age presents new challenges for teachers and students. Prior to 1-to-1 in the classroom, students dutifully took notes on paper and in notebooks. Now that our students have Chromebooks, this process of knowledge transfer can take on a different form. Note taking should be more than "just transcribing information" (source). With their notes, students can "curate and synthesize information so that they can make conclusions, build deeper understanding, and construct new knowledge" (source). Teachers can build time into their period to allow students to reflect on what they learned to strengthen their comprehension of the content. Google's Explore tool can help students curate and synthesize information. Students can type a few key vocabulary words into the body of a Google Doc then click on the Explore button on the lower right corner of the screen. Google will pull up related research, topics, and images related to the topics in the Doc. Students can also search directly from the Explore tool, without having to leave their Doc. Digital note taking should support students, allow students to save across devices, have the ability to search, and students should be able to share their information. Using the 4Ss will ensure students are able to curate, synthesize, and reflect on course content.